Take your shoes off, cover your head, wash your hands and step down into the flowing stream to cleanse your feet of an impurity they may carry. Once you have prepared yourself, follow the white marble steps to a gold garnished temple that has enchanting music drawing you to its doors. 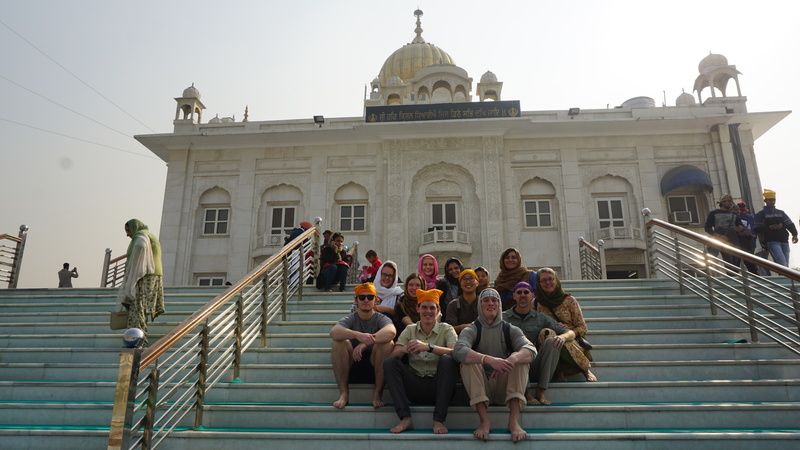 After three months in India, I finally stepped foot into my first Sikh temple, Gurudwara Bangla Sahib in New Delhi. Just days before arriving in the North I found myself wondering if I would learn more about the world’s 5th biggest religion, a religion that had been founded in India. 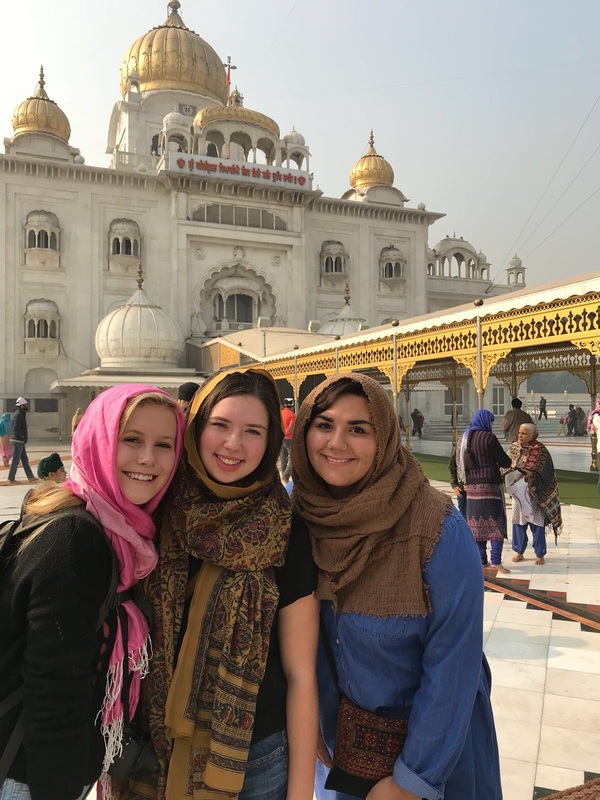 I wondered how I had been in India for three months without learning about or seeing a Sikh temple. After researching, I found that about 76% of India’s Sikh population is concentrated in India’s northern Punjab region with small pockets of faithfuls living in other parts of the North. Although I have been in my fair share of large Indian cities, most have been in the South, an area where Sikhs are few and (very) far between. I had visited more Hindu temples than I can count, seen countless Mosques, and explored ancient Buddhist monasteries, but until last week I had not even laid eyes upon a Sikh temple. Walking into Gurudwara Bangla Sahib, I had no idea what to expect, but I was floored by what I found. While the white marble, gold plating, chandeliers, royal carpeting, live music and faithfulness of the devotes left me amazed; it was what was down the steps that left me in awe. It left me wondering more about this religion I did not know about before coming to India. Today, Sihkism is the worlds 5th largest religion and the 4th largest in India, behind Hinduism, Islam, and Christianity. The 20 million Sikhs that call India home make up 1.8% of India’s population. Their religion was founded in India in the 16th century by Guru Nanak. He founded this monotheistic religion on the ideas of optimism, tolerance, and service to all humanity. Followers are not supposed to recognize India’s caste system; instead, they should see everyone as equal, as their brother. Women are given equal rights and are allowed to participate in all ceremonies. Over all, Sikhism seems to be a very progressive and humanitarian religion. The two key pieces of Sikh religion are Sangat and Pangat. Sangat refers to the congregation and Pangat, well it is the thing that left me in awe. Down those stairs to the left of the temple, I discovered the key piece of this religion that left me speechless; I found the community kitchen, the Pangat. 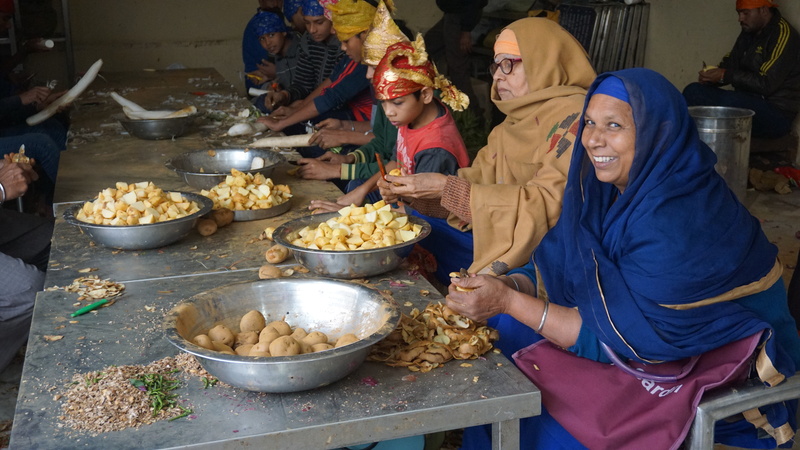 We walked in to the kitchen past tables of families pealing potatoes and prepping other food. The only question asked was, “Have you washed your hands?” A reply of ‘Yes’ allowed us to sit down on small benches, not more than 3 inches off of the ground. In front, were piles of dough, wooden boards, and rolling pins on top of long marble tables covered in flour. We sat there for 20 or so minutes rolling chapati. Around us, lentils, vegetables, and rice were cooking in large pots. 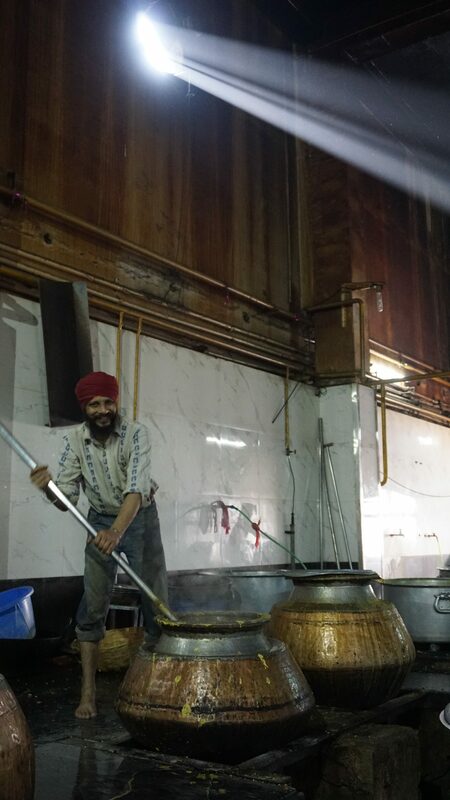 This kitchen is staffed totally by volunteers and funded by contributions of Sikhs who volunteer here to fulfill their religious obligations. There we were 12 Americans sitting in the middle of this chaotic Sikh kitchen, rolling chapati. When sitting at this table surrounded by strangers preparing food for people you would never meet, you could not help but to feel joyous. It showed the power of food and humanity, people from all walks of life came together to prepare food for anybody who wanted it with no questions asked. 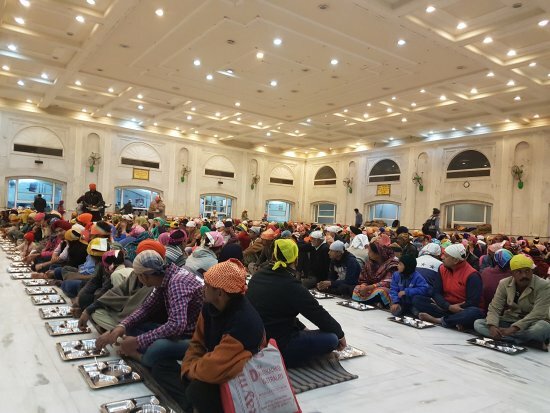 This kitchen, or langar as they call it, is open from 12 pm to 11:45 pm; it is there to feed all devotees, pilgrims, and visitors to the temple. In total, about 10,000 people are fed there each day. Aside from the fact that food is made, it was unlike any soup kitchen that I had been in before in that the space was dignifying. Back home soup kitchens tend to have the bare minimum, but this space was beautiful. Being right next to the gold adorned temple, the dining hall did not look out of place. The floors were white marble with red rugs laid on top. Big windows filled the room with light that fell on the detailed marble walls. It was a place of dualism, a place for rich and poor on the very grounds of the temple. Walking into this temple I had no idea what to expect, walking out I was left trying to find words for what I had just experienced. In a city where immense wealth is surrounded by poverty, it was refreshing to enter a place where the physical separation is not found between the two. This “soup kitchen” is a space where humanity is celebrated no matter what ethnicity, creed, or class you belong to. As my time in India draws to a close and I reflect on all the religious sites we have visited, I find this to be the most impactful. Over my time here, I have observed the different religious practices I have come across, but last week I participated in one. 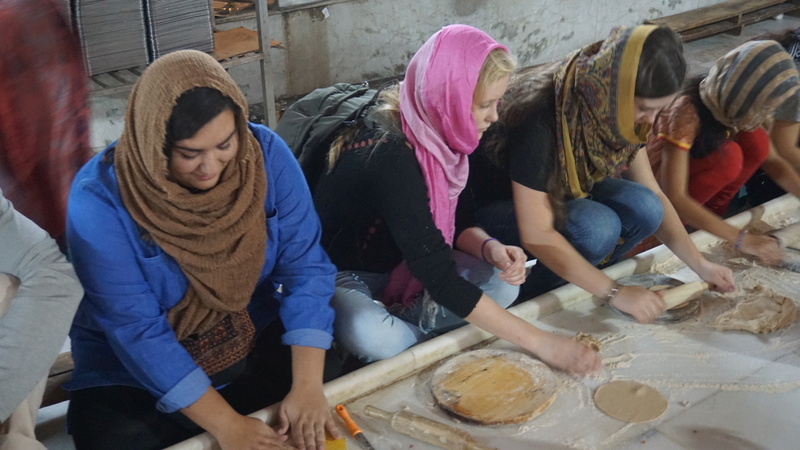 Rolling chapati and celebrating humanity in a kitchen with strangers is something that I won’t soon forget. What Is Sikhism. What Is Sikhism, Delhi Sikh Gurdwara Management Committee, 2016. Gracey, Marilyn. (2017). The Diversity of Indian Cultures and How They Perceive the Environment. Lecture, Madras Christian College, 12 September 2017.